I decided to post this here rather than mess up the thread on the black bee discussion some body mentioned wing morphology, can some one explain this and how can it be used to check hybridization or am i way in over my head , but Iam curious. You compare the length of certain parts of the bee's wings. By doing so, you can distinguish certain bee races, like Black bee from Italian bees. Also you compare certain points on the wing and how they are located to each other. It is very tricky to identify bees by doing so, and you need at least 50 bees from each hive. Some use a overhead projector: glue a wing to a transparent and put it on the projector. The wing appears on the silver screen or wall where you can read and measure the wing more accurately. Or you shoot photos with your digital cam and measure with a software. Both ways you produce ratios. The ratios of different bees you find in tables. PS: that wing shown above is from one of my survivor stock. The wing morphology was used to distinguish Black bees from Carnica. You can't distinguish Italian bees from Carnica by wing morphology. Which is not necessary anyway, because of the light colour of the Italians. >The wing morphology was used to distinguish Black bees from Carnica. You can't distinguish Italian bees from Carnica by wing morphology. Which is not necessary anyway, because of the light colour of the Italians. 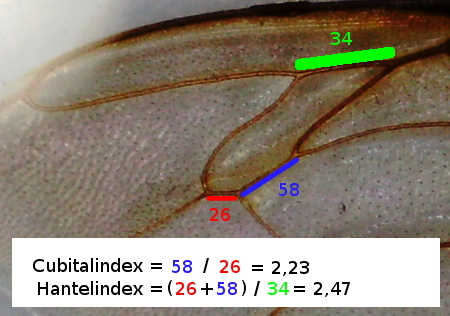 Wing morphometry will easily distinguish between Carnica and Ligustica as the Cubital Index values are very different. Wing morphometry was devised by Ruttner to distinguish between various mellifera subspecies, not just Amm and Carnica. 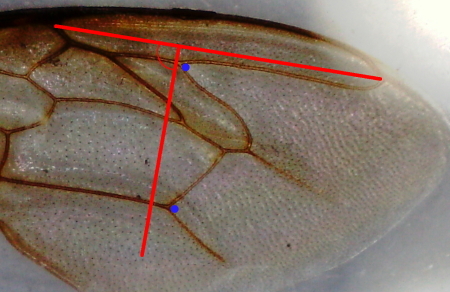 Certainly wing morphometry is not necessary to distinguish between Ligustica and Carnica because they have different abdomen colour but if you only had a set of wings from each it could quite clearly separate them. It shows that the differences between Amm and the other two are far greater than the differences between ligustica and carnica, demonstrating that they came from different ancestry: Amm from Africa via the Iberian peninsular, and the others from around the eastern end of the Mediterranean. Note especially that discoidal shift is always negative for Amm and always positive for the other two. Practically speaking this is what you do. You need a very high resolution scanner, a windows computer, software available from the BIBBA website. Get your bee sample, remove either the left or right wing off all your bees, scan them on your scanner. The software then measures all the appropriate angles and length of certain wing veins. After that using Excel it plots a graph you can interpret. There is a little bit of fiddling to do to get it right. I do not have a windows computer so I am a bit stuck on that front. The 'thrice out of Africa' link in the list below explains the current thinking re the origin of the European mellifera subspecies. I would not rely on the Dave Cushman website for anything related to bee genetics. It is a useful start point as is wikipedia but there is a lot of opinion on there not backed up by reference. Tks thats loads of info to keep me entertained for a while. I looked up that Irish site and there is lots to read there too.